Plans for 46 more homes in the village of Great Bowden, near Market Harborough, will be “vehemently opposed” by the parish council. The scheme from Gladman Developments would put the new houses, with some public open space, on land at Leicester Lane, Great Bowden. 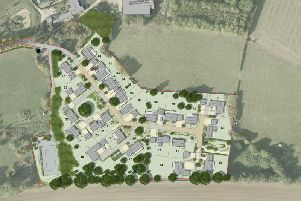 The proposed new estate would be right next door to another village development site, which already has outline planning permission for 50 new homes. But Great Bowden parish council, which met on Tuesday night, says there can be “no justification” for more houses in the historic village. “Great Bowden Parish Council is vehemently opposed to any proposed additional large scale housing developments within it’s boundary of development, as per our newly-adopted neighbourhood plan” said parish council chairman Adam Shepherd. Local district councillor Phil Knowles said: “I’m really deeply concerned about all the development in Great Bowden. I’m worried about the environmental impact and an infrastructure already under great strain. Gladman Developments argue that their scheme is a “logical extension” to Great Bowden.